Championship clubs making losses of more than £6m will be fined millions of pounds or put under a transfer embargo from the 2014-15 season. Three of the 24 clubs voted against new regulations to limit investment from owners and curb total spending. The changes will also prevent owners from funding their clubs through loans. Football League chairman Greg Clarke said: "They will begin to lay the foundations for a league of financially self-sustaining football clubs." Owners will be allowed to invest £6m next season, £5m the year after, then £3m in the 2014-15 season. From 2015-16, clubs will be allowed to make a £2m operating loss, as well accept a £3m investment from an owner - allowing for a £5m overall loss. Clubs promoted to the Premier League that fail to adhere to the amendments must pay a fair-play tax on their losses, ranging from 1% on the first £100,000 to 100% on anything over £10m. Non-promoted clubs will not be punished financially for failing to adhere to the new rules, but instead placed under a transfer embargo. Youth investment and accounting charges from past spending on players and stadium-building will not be included. 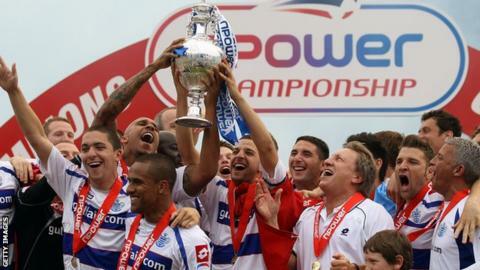 QPR made a loss of £25.4m in their promotion season and would have been fined an estimated £3m if the new regulations had been in place last year - after excluding unaffected investments, such as youth spending. Clubs relegated to the Championship will not be subject to sanctions in their first season as long as they have met their financial obligations under Premier League regulations. These new regulations seek to curb the risks some clubs go to when pursuing their dream of reaching the Premier League. Riches await those clubs who reach the Premier League. But, as Portsmouth's recent troubles demonstrate, those who live beyond their means often have a long way to fall when the dream turns sour. They would, however, have to pay the fair-play tax if they did not comply with the new regulations and got promoted. The new regulations are based on Uefa's break-even model of Financial Fair Play and come after the Football League's research revealed the 72 clubs of the Championship, League One and League Two are on course to accumulate £2bn of debt. And chairman Clarke is happy the trend is to be reversed after the successful vote on Wednesday morning. He said: "On the pitch we have three exciting, competitive divisions with crowds at their highest levels for 50 years. "But that success isn't necessarily being reflected on our clubs' balance sheets and we have to remedy that situation or face an uncertain future. "I'd like to commend the Championship clubs for the courageous decision they have taken today. "It means that for the first time, all 72 Football League clubs have agreed to take concerted action towards controlling their financial destiny." Leagues One and Two will continue to limit spending on wages to a proportion of turnover.